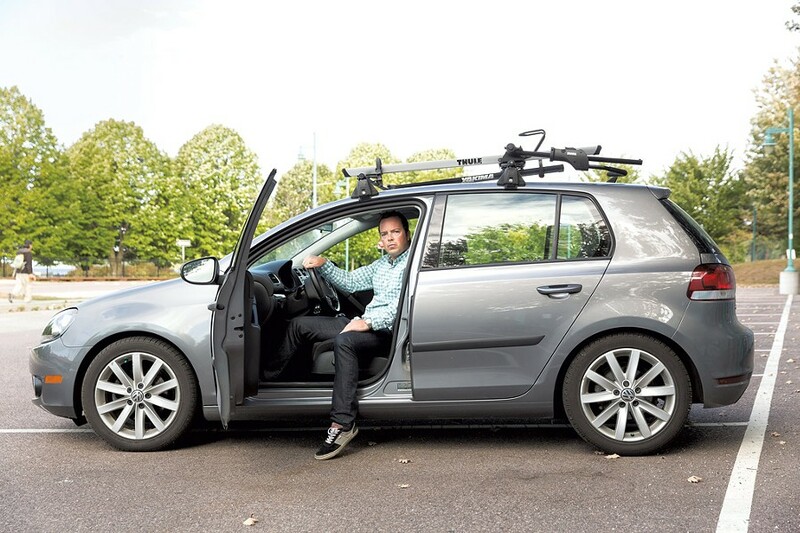 Brendan Taylor used to describe his 2010 Volkswagen Golf in loving terms, such as "sporty," "reliable" and "efficient." He said he felt great about driving a vehicle that produced less air pollution than its gasoline-powered counterparts. After all, VW touted it as "clean diesel," and the car got upwards of 40 miles per gallon. Now the Charlotte resident and marketing director at Seventh Generation employs much different language when talking about his gray Golf: He feels "betrayed," "duped" and "hoodwinked." And he's not alone in Vermont, which has four VW dealers and close to 3,000 affected vehicles registered. On September 19, Taylor learned with the rest of the world that the German automaker lied about the amount of nitrogen oxide pollution coming from the tailpipes of 482,000 diesel VWs and Audis sold between 2008 and 2015 in the United States. Through the use of secret software, known in the auto industry as a "defeat device," these cars activated their full emissions controls only when they were being tested, so they appeared to comply with the Clean Air Act. When the vehicles were driven on the road, those emissions controls automatically turned off or eased, and the cars spewed up to 40 times the legal limit for smog-producing nitrogen oxide. The scandal has turned into a financial and reputational crisis for Volkswagen, the largest automobile manufacturer in the world. The Environmental Protection Agency could levy fines up to $37,500 for each vehicle in the U.S. — for a total possible punishment of $18 billion. Faced with that news, the markets erased 20 percent of the company's value on September 21, the Monday following the announcement. By September 23, VW CEO Martin Winterkorn had tendered his resignation, and shortly thereafter the company named a new CEO, who vowed to reorganize the company's management structure. "I think this is going to eviscerate their brand," predicted Taylor, 39, an active father of two who has an MBA from the University of North Carolina. * "This is a company that trades on consumer love, and they've completely eroded that." Taylor owned a VW Passat before he decided to replace it with the Golf. He purchased the car for its performance, great gas mileage and high resale value. "Now that whole proposition is shot," he said. He doubts he will ever own a VW again. VW dealers around the state are expressing a range of reactions, from nonchalance to deep disappointment. The company has prohibited them from selling any affected model, new or used. Shawn Davis, a sales manager at Langway Volkswagen in Manchester, did not sound particularly worried. VW, he explained, is waiving or reimbursing the expenses that can accrue to dealers when cars sit on a lot for more than 30 days. "VW is taking care of the dealers, so it's not as big of a deal as it otherwise would be," he said. His blasé reaction may be explained by the fact that Davis was selling Hyundais last year, when that company was busted for overstating the fuel efficiency of certain models. He's not surprised to find a glaring example of dishonesty in the automobile industry. On the other end of the spectrum is William Shearer, the owner of South Burlington's Shearer Volkswagen. "This was a terrible, inexcusable act, and we're a victim just like the EPA and the consumers who bought these cars," he asserted. Diesel models make up about 40 percent of Shearer's VW sales, and now approximately 25 of them are locked up on his property until VW figures out how to bring them into compliance. "It's a worry for us, for sure," he said. "We'll sell less cars. We still have a lot of gasoline models and used cars and ongoing repairs and parts we sell. We'll survive, but it's going to be painful." Mike Nicastro, the general manager at Walker Mazda Volkswagen in Barre was frustrated by the lack of an immediate solution. "We're just anxiously waiting to hear what the fix is going to be," he said. "As soon as we get some direction from Volkswagen, we'll know how to assist our customers and get this thing resolved and behind us." Kinney Motors in Rutland, the only other VW dealer in Vermont, did not respond to calls from Seven Days. Inquiring customers are being told that their cars are safe to drive until VW issues a recall. And there's been a lot of speculation about what that will entail. One possibility is that VW changes the emissions-control software so that it operates at full capacity all the time. But that would likely reduce gas mileage and horsepower, leaving owners with cars less "sporty," "reliable" and "efficient" than they bargained for. Another option is to install new hardware, such as a system that uses the chemical urea to scrub nitrogen oxides from the exhaust. That also presents problems, because it's expensive and the urea tank would take up cargo space. Either repair would likely reduce the cars' resale value. Whatever the solution, some owners may decide to forgo the recall and just drive their cars the way they are, choosing better performance and efficiency over cleaner air. That may benefit Black Bear Biodiesel in Plainfield, which sells locally made B100, a petroleum-free fuel with a lower carbon footprint and fewer sulfur and carbon dioxide emissions than conventional diesel. Co-owner Jim Malloy estimates that drivers of the VW models affected by this scandal make up about 25 percent of the traffic coming through his station. "Of course, some people are upset with Volkswagen," he said, "but they're all very pleased with their choice of biodiesel." The downside: The alternative fuel emits the same amount of nitrogen oxide as regular diesel, and using it may void their car's warranty. Volkswagen can't force owners to get their cars updated. That leaves the job of enforcing emissions regulations to the Vermont Department of Motor Vehicles, which oversees state vehicle inspections. Theoretically, state inspection stations could fail these cars — there are 2,906 affected VWs and Audis registered in Vermont — but they would have to change the way they perform inspections. Vermont does not actually test tailpipe emissions. The state uses the On Board Diagnostic II system to make sure cars are operating properly, and it only raises a red flag if the car's computer registers a malfunction or abnormality. According to Captain Jake Elovirta, the chief of safety at the DMV, these diesel models circumvented that. "When you plug in the sensor, you're getting a positive reading that the equipment is working properly, but it's false," he explained. "Obviously, this is an issue for us, and we're assessing what to do about it." In the meantime, the lawyers are mobilizing. The U.S. Department of Justice has opened a criminal investigation into VW's conduct. On Wednesday, Tristram Coffin, the former U.S. attorney for Vermont who now works with Downs Rachlin Martin PLLC, filed a class action lawsuit against Volkswagen on behalf of Charlotte resident Robert Turnau. The complaint alleges that owners of Volkswagen diesels have suffered damages "as a result of the company's falsification of emissions testing equipment." In a statement about the action, which claims Volkswagen violated Vermont's Consumer Protection Act, Coffin said, "These owners face lost value, unknown repairs, the disruption of a massive recall, and the substantial cost and hassle of owning a lemon because of a decision they made when they tried to do the right thing for the environment." The suit seeks compensatory damages. Other law firms around the country have filed at least 25 similar class action suits. The following day, Vermont Attorney General Bill Sorrell announced he was opening an investigation into Volkswagen's emissions violations and deception. Sorrell is collaborating on the investigation with Deb Markowitz, the secretary of the Agency of Natural Resources. "VW has compromised Vermonters' health by increasing pollutants that can aggravate respiratory conditions like asthma, and threatened our crops and forest," she said. Is there any way for this to end well? South Burlington dealer Shearer recalled a situation in 2008 when Toyota made defective truck frames — and handled it perfectly. "They went to everybody who was affected by this and either fixed their truck, bought their truck from them, or gave them a good deal on a new one," he said. "Most people have never heard about that story, because they made everybody happy. In this case it's a little different: They deceived people, and people polluted when they didn't want to. We're going to have to wait and see how they solve this." In Taylor's opinion, as both a customer and a marketing professional, there's only one way VW can recover from this: give away new cars. He said, "They need to make an apology on such a grand scale that people start talking about the amazing things VW did in response to this, instead of the horrific thing that led to it." Correction 9/30/15: An earlier version of this story misstated Taylor's educational background. VW drivers can get info at vwdieselinfo.com. The original print version of this article was headlined "Fuming: Volkswagen's Deception Impacts Nearly 3,000 Vermont Drivers"